The Landsat 8 spacecraft was built by Orbital Sciences Corporation. The spacecraft contract was awarded in April 2008. The spacecraft accommodates two government-furnished instruments forming the Landsat 8 Observatory, OLI and TIRS. The spacecraft has a design life of 5 years, but carries sufficient fuel for 10 years of operations. The Operational Land Imager (OLI) was built by the Ball Aerospace and Technologies Corporation. The Ball contract was awarded in July 2007. OLI improves on past Landsat sensors using a technical approach demonstrated by a sensor flown on NASA’s experimental EO-1 satellite. OLI is a push-broom sensor with a four-mirror telescope and 12-bit quantization. OLI collects data for visible, near infrared, and short wave infrared spectral bands as well as a panchromatic band. It has a five-year design life. The Thermal Infrared Sensor (TIRS) was added to the Landsat 8 payload to continue thermal imaging and to support emerging applications such as evapotranspiration rate measurements for water management. TIRS was built by NASA Goddard Space Flight Center, and it has a three-year design life. The 100 m TIRS data is registered to the OLI data to create radiometrically, geometrically, and terrain-corrected 12-bit Landsat 8 data products. 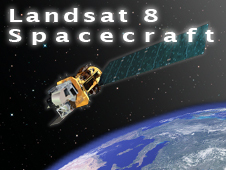 The Landsat 8 Ground System includes all of the ground-based assets needed to operate the Landsat 8 observatory. The primary components of the Ground System are the Mission Operations Element, Collection Activity Planning Element, Ground Network Element, and the Data Processing and Archive System.